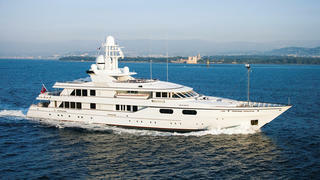 The 60.66 metre motor yacht Meduse, listed for sale by Stuart Larsen at Fraser Yachts, has been sold. Built in steel and aluminium by Dutch yard Feadship to a design by De Voogt, Meduse was delivered in 1996 and refitted in summer 2011 including a complete rebuild of her main engines. Her voluminous interior sleeps 13 guests in seven cabins consisting of a master suite forward on the main deck, a VIP suite, a double and two twins, all with en suite bathroom facilities. In addition, there is a single nanny cabin adjacent to the starboard twin, sharing the en suite bathroom. The aft deck comes with built in upholstered seating and two dining tables, each seating six guests, and there is also a wet bar to supply those welcome al fresco cocktails. Up in the sky lounge, the area is currently arranged as a music recording studio and there is a skylight over the seating and bar area. Doors lead out to the upper aft deck with seating and a teak table for 12 guests, along with a bar, barbecue and retractable awning. Forward on the sun deck is a Jacuzzi spa pool and waterfall, large sun pads, a bar, extensive seating and a custom hard top. Further features include an elevator through three decks and a helicopter pad capable of supporting a Bell Jet Ranger helicopter or similar. Twin 1,710hp Caterpillar diesel engines give her a range of 5,380 nautical miles and she is fitted with zero speed stabilizers. Lying in San Diego, California, Meduse was asking $25 million.